Q. Can you tell me anything about Imperlux Glass? I have a decanter that has a foil sticker that reads 'World's Finest Imperlux made in Czechoslovakia." "Imperlux" appears to have been a term trademarked by the Imperial Crystals & China Co. (New York, NY), referring to lead crystalware. 1957-58 Catalog of Crystal and Chinaware. New York: Imperial Crystals and China Co., 1957. This catalog includes a perforated tear page in front of catalog that reads: "The world-known Trade Mark, 'Imperlux' assures you that the crystalware shown in these pages is the finest quality mouth blown lead crystal. It is all hand cut and imported from Germany and Czechoslovakia." World’s Finest Imperlux Genuine Handcut Lead Crystal, 76-77. New York: Imperial Crystals & China Co., Inc., 1976. 120 pages, with "Imperlux" in the title. Image: Part of an advertisement for the Gift Department at Abell Lumber & Hardware that appeared in the November 25, 1965, issue of The Odessa (Texas) American. Newspapers.com. If you wish to borrow copies of library items, including the microform versions of the trade catalogs mentioned above, please contact your local library. The Rakow Research Library will lend designated items, including microforms, to other libraries. Your library can request items through the OCLC WorldShare Interlibrary Loan (ILL) system or by direct request through email at ill@cmog.org. For more information, please see our ILL policies and procedures. We may also be able to scan catalog pages containing specific information and email them directly to you. 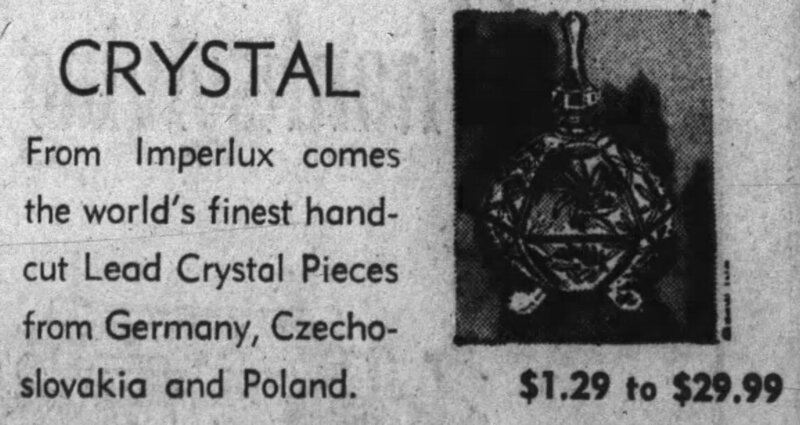 While there are many mentions of "Imperlux" in conjunction with items for sale/sold online and a handful of advertisements in newspapers mentioning "Imperlux" lead crystal available through the subscription database Newspapers.com, we do not appear to have any additional information on the Imperial Crystals & China Co. or on Imperlux lead crystal. We will update this answer if additional information becomes available. Please don't hesitate to ask us your glass-related questions in the future! What makes crystal glass different from general glass?